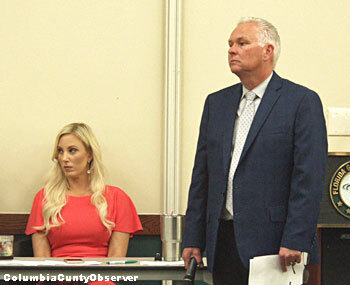 COLUMBIA COUNTY, FL – Tim Murphy's Monday night Economic Development Summit was billed as a meeting to exchange ideas and "speak freely when you're there." Nobody looked happy to be there and even though Chairman Murphy said that he was looking forward to input from the public and there was hope that the College would remove the public's gag order, it was not lifted, leaving many in attendance with a bad taste that the meeting was nothing more than Columbia County 5 politics as usual. Chamber Exec. Dir. Dennille Decker and Chamber President Mike McKee did not look happy during the entire Summit. Florida Gateway College (FGC) Director of Communications Mike McKee did a yeoman's job of mc'ing Tim Murphy's Summit. He had a difficult tightrope to walk, as both FGC's number one public relations person and the president of the Chamber of Commerce. Chamber Executive Director Dennille Decker had the unenviable job of vetting questions from the audience. The two hour summit produced seven questions. According to Ms. Decker, none had to be edited. While the meeting was held at the College, the County was the lead agency and it was understood that it was a County Commission sponsored meeting held at the college. The Summit rules, which were not approved by the County 5, were that questions had to be written and vetted for appropriateness. According to Mr. McKee, the rule to vet the questions, have them written, and then read were a combined effort of Ms. Decker, Mr. Murphy and himself. Late last week Ms. Decker said that the rule was instituted by the College's Mr. McKee because he was worried about inappropriate material going out over the air waves. Yesterday Mr. McKee explained, "This is a conservative community. We didn't want anything inappropriate to be said, that's why we had people write down their questions." What could have been inappropriate? County Attorney Joel Foreman (2nd from right and City Attorney Fred Koberlein (4th from right) were on hand, as well as Asst. Cnty Mngr. Scott Ward (far left), City Clerk Audrey Sikes, and Acting City Manager Grayson Cason. The Lake City Police Dept. was in the audience. 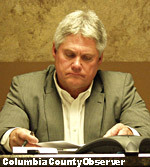 While no one would go on the record, what would have been considered inappropriate was mentioned to the Observer: curse words; questions and criticism by the county of the way the city utility is run; questions and criticism of the city; questions and criticism of the county; questions and remarks about the county's Economic Development Director Glenn Hunter, who had become the "whipping boy" for the County's mainstream print media. Many in the audience thought the rules were inappropriate. The prior restraint resulted in only seven questions, which were held out until the end of the meeting. Only one questioner was identified. Nick Patel and City Councilman Jake Hill. Neither looked very cheerful the entire evening. Hotel Owner Nick Patel, a member of the Tourist Development Council, said the County needed to put money away for economic incentives so it could be competitive with others. "Most of the time funds are not available to do that. When you are looking for two or three million dollars, the County or the City doesn't have the money." 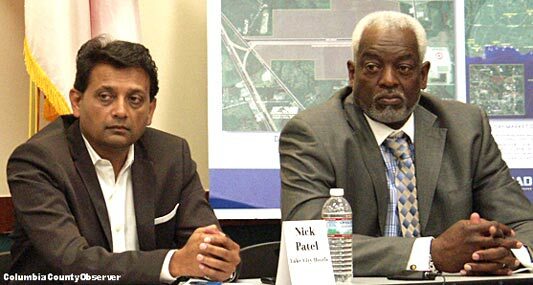 Mr. Patel recommended that both the City and the County combine their contributions and put the money in the same pot every year: "It is the only way you'll have better leverage. And if you can't incentivize better than the other ones, they are not going to come here." A County Commissioner since 1982, Com. Williams' homey homilies did not answer why for decades Columbia County, the county with the 'perfect location', was and remains confused, in the dark ages of economic development, and is operating without a workable strategic plan. While Commissioner Williams monopolized most of the conversations and had something to say about almost everything, neither he nor anyone else brought to light that the unexpected development along Lake City's I-75, U.S. 90 corridor was as a result of not only the luck of location, but primarily the work of former Lake City Manager Wendell Johnson and the City Council. Commissioner Ronald Williams is a Columbia County/North Florida living legend. He had something to say about almost everything. Mr. McKee asked if anyone was impatient with the progress of economic development. Commissioner Williams opined that he was impatient with the progress of economic development. "You're damn right; I'm impatient. I'm tired of kicking this darn can down the road. I'm the person that if I put fertilizer on the grass, I expect it to be created in the next hour." He continued, "I don't think we work collectively as a body. That's everybody from the newspaper to the janitor that has somethin' to do with Columbia County." Com. 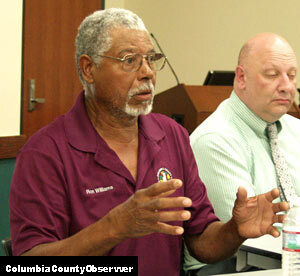 Williams said that a lot of people say Columbia County should be seeking high paying jobs. "We're not Marion County," he said. Com. Williams repeated his decades old refrain that a "minimum wage job is better than no job." Chairman Murphy followed up, "We can't be successful without the success of the City Council and every other business in this community." As of Friday May 4, it has been reported that the City and County are planning meetings to discuss utilities, specifically along Bell Road. 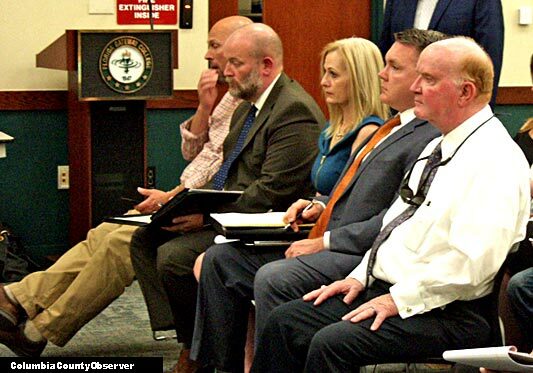 Yesterday, Acting City Manager Grayson Cason said, "You can rest assured that if the City holds a meeting and it is supposed to be in the sunshine, it will be. In Part III: the rest of the meeting.